I was timetabled for five one-hour lessons in this week; four with my Y10 GCSE Maths class and one teaching SRE. It’s an important part of the job as far as I’m concerned. My Maths class is fascinating, challenging and rewarding to teach; I feel like I’m making a difference to them but it’s hard work for sure. Mindset issues play a huge role every lesson. I like the immediacy of the knowing how well everyone is doing and the challenge of teaching in a new context. Teaching Maths has helped me be a much more effective line manager for Maths than was possible last year (when I taught Science). I’m part of the SRE team, teaching every Year 8 class on a five-week rotation. In this particular week I was joined by a visiting SRE advisor for a session on STIs; we also answered some of the questions in a box. It’s always fascinating. Again, I think it’s important to lead by example and take part in the delivery, especially in a year when we’ve just introduced weekly PSHE lessons. I have the pleasurable task of observing all the new teachers this term. This week I had a feedback session with an Art NQT after watching him teach on Friday the week before and then watched a Geography NQT. Both had delivered excellent lessons, teaching with confidence and enthusiasm. I love seeing new teachers thriving in the classroom and always enjoy the discussion afterwards. I’ve seen enough lessons to be able to talk sense about still life drawing and weather fronts; knowing something about the content makes the feedback much more incisive. The Wednesday CPD was one of our new built-in two-hour slots. We spent time talking about behaviour systems, how we’re using assignments and spent a good hour looking at each others’ books, discussing a range of issues that emerged. It’s important to me to be in there amongst teachers, working alongside them on the details. We have SLT members in several of the subject CPD sessions which helps us enormously. The weekly SLT meeting was chaired by a Deputy Head, as per the weekly rotation. We try to keep our meetings to 90 minutes – punchy and detailed. Sometimes we take longer but it’s usually enough. There’s also the weekly bulletin/diary meeting. In this week I had meetings with four members of the SLT; the AHT running our behaviour system, our Director of Research, the Deputy Head i/c Sixth Form and the Business Manager. As you can see, finance was a big theme in this week. All SLT members have a year or key stage responsibility as well as an area of strategy; that means our meetings are a mixture of talking about big picture issues and detailed student issues. There were two important one-off meetings this week. On Monday I pulled together key people leading on aspects of literacy to make sure we’re planning a coherent approach. This included the Head of Learning Support – leading on reading interventions; library staff – leading on a new whole-school reading strategy (tutors will be reading To Kill a Mockingbird to their tutor group after half-term); our Director of Spoken Literacy – leading on rhetoric across the curriculum – and the Deputy Head coordinating things. It was a productive meeting. We identified the need to take more planned action to tackle the issue of reading across the curriculum and we’ve got a good plan for ensuring structured speech events happen for all students across all subjects. On Tuesday I met with the Director of Education, Head of School Improvement and Chair of Governors to review our progress with our achievement plan for the year. It was a supportive meeting; they understand the complexity of the issues. At the same time, they know what is working elsewhere in the borough and make their high expectations clear; it’s far from cosy and soft. A healthy, positive meeting. Every Friday morning I meet with the Head of Behaviour and the AHT for Behaviour. We run through the progress of students in the support centre, any pressing issues with finding alternative provision and various other procedural matters. It’s a helpful weekly stock-take. Our upgraded BfL system was also a key element of the Parents’ Forum – see below. I will have had various students brought to me during the week too; I’m the last port of call for students having trouble around the school and it’s a routine part of school life to deal with students, parents and staff to resolve matters. On Friday lunchtime in this week, I was heavily involved in a situation with a troubled Year 7 boy. Being the boss – the employer – is a major part of headship; it’s inextricably linked to the agenda for learning and achievement. As well as dealing with some individual issues, this week I ran a lunchtime briefing for staff applying to go through the threshold or up the upper pay scale, mainly about using the Bluesky system. I also ran a special briefing for all Reviewers ahead our Professional Review meetings next week; I’m keen that people use the software properly and conduct their reviews in the right spirit focused on career planning and CPD. On Tuesday we ran a meeting for all staff interested in our Leadership Development Programme – aspiring middle leaders and senior leaders. It needed a bit of a kick-start so we gathered everyone together. It was a big week for music. I attended the half-termly Year 7 and 8 Singing for Success assemblies, contributing my voice from the back row! The Thursday concert consisted entirely of compositions by our Y11 GCSE music class – an outstanding event; I’m really glad I went even though it meant three consecutive nights beyond 8pm. I met the Head of Music, who I line-manage and, finally, on Friday, had an interesting meeting with a Y9 student and his father regarding music and their particular interpretation of Islam. He and his brother can’t/won’t play instruments because of their religious beliefs. We had a frank discussion and came to an agreement; I went in trying to be hard-line about it but came away realising their line was harder than mine. Finance had a high profile this week for various reasons that all coincided: a) the termly finance committee had its meeting b) we had the final report of a full school Audit and c) our SBM has a new job and was in her final fortnight before leaving. It’s no secret that managing our £9million budget is something I do out of necessity; I’m not a money person and I prefer to engage at the most macro level I can. That said, I need to know enough to inform the strategy. I’ve had a big idea about investing in IT with a big one-off investment spread over a few years and that got the ‘in principle’ green light. The audit also went well and it looks like we’re on track for a balanced in-year budget more or less. Phew. I’ve got some great new governors involved with finance which gives me peace of mind as we’re in transition between SBMs. Parental engagement is always a big theme – via emails and meetings – but this week’s Parents’ Forum was an especially big deal. We arranged it to explain two major pieces of work on KS3 Assessment and Behaviour for Learning. I’d say about 80-100 people turned up which is much more than usual. The feedback was very valuable if challenging at times. In discussing behaviour, some parents find it all too negative, perhaps wishing we didn’t need to discuss it quite so much. I took that message on board. We explained our KS3 system (one of my AHTs led the presentation) and took questions. It will take time to bed in for all of us. I’ve had a bit of feedback suggesting I wasn’t on peak form that night – not full of joy as I might normally be. Basically, I was tired – but I’ve learned a lesson: I can’t afford to have an off-night in front of parents; it sows seeds of doubt unhelpfully. Next time, I’m going to sparkle! The next day, before the concert, I attended an informal gathering of prospective parents at a current parent’s house nearby. They invited me so I went; I met lots of lovely people keen to ask more about the school. These people are key opinion formers in the community and I’m happy to give time to helping make their choice. I hope they made the right one! Finally, I spent some time in this week looking beyond the school. I’ve tried to avoid it this term, saying ‘no’ to most offers and requests, but this was special: an invitation to support an away-day for the House of Commons Select Committee on Education. I zoomed down to a building off the Mall to join a panel Dr Becky Allen from Datalab, Sir Kevan Collins from EEF and Ed Dorrell from TES. We had an hour to tell the MPs what we thought about accountability, leadership, examinations, academisation, funding – a wide range of issues. It was nice to be asked and I’m glad I went – even though I was really close to cancelling, not least because I had to get one of my Maths lessons covered. That’s rare. In the same week I had a visit from Lucy Powell’s new education adviser. I gave her half an hour’s worth of advice based on my experience of engaging with her predecessors – the need to really understand things at school level before making up policies driven by politics. It’s a complicated business; I don’t envy her at all. Finally, I made time to push forward on the National Bacc. I’ve been so busy this term, it’s been hard to give this much time. We’re still operating on a shoestring. The meeting on Friday was exciting – seeing our embryonic website come to life. Within a few weeks we’ll have it up and running; it felt good to see something tangible and we’re on track to be operating in earnest from next year. 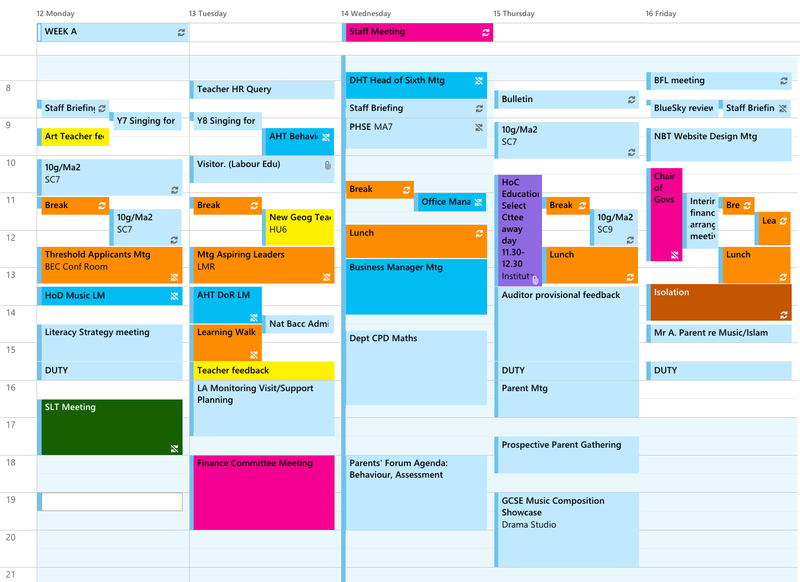 A busy week – but not especially so. It’s always like that! This is the job. It’s full-on for sure but intensely rewarding. Half-term came at exactly the right time and now I’m ready for more. I’m going to be projecting joyfulness all around!! « Towards Impeccable Behaviour: Phase 2. 1. For each role which skills do you need to be particularly well developed to be effective. 2. Prioritise the roles -100 marks in total, distribute through all the roles. This is really interesting, thanks for sharing. Make sure you’re selective about who you ask to meet in the early mornings! This is important time for teachers to get in the right headspace for the day ahead, and compulsory 8am (or earlier) meetings can be unwelcome, especially when they are a regular commitment! Absolutely fascinating, thanks so much for sharing. As a middle leader early on in my career it’s so valuable to have this really honest and detailed look into the life of a head – to help my colleagues and I empathise as much as understand where some of us many one day be headed. I’ve been an avid reader since a colleague showed me your blog and really can’t express enough how much I enjoy reading your blogs! I’m sure it’s tough keeping it so up to date so on behalf of aspiring young teachers everywhere, thank you Tom. Thanks Charlie. I’ve found blogging the experience of headship hugely rewarding and valuable. I’ve decided to enjoy the job more – after a period of feeling a bit weary and burdened. I love the job – and I’m on a renewed mission to express the joy more explicitly!